The latest issue of Premium Incentive Products magazine features an Employee Engagement Roundtable moderated by associate editor Deborah L. Vence which focuses on game components, social media and mobile as leading industry trends. Vence starts off by raising the point that having engaged employees leads to better service, customer satisfaction and overall profits. Hinda vice president, client services Stacey Wilson offered her input on employee engagement from the Hinda perspective. Wilson notes that the key is understanding that you need your employees to help build your business. Incentivizing both veteran and newcomer employees as the job market improves is imperative in order to make your business grow and prosper as opposed to flatlining. As a final thought, when asked about the outlook of employee engagement over the next few years, Wilson says, “I think it is important that the focus remain on the employee. The quality of your team is what is truly important.” Now that’s a concept we can all get behind! Miss Part I? Read it here. A particularly interesting and lively session I attended was a keynote by Jay Baer, social media speaker, coach and co-author of “The NOW Revolution: How to Make your Business Faster, Smarter and More Social” (also the title of this session). His blog, Convince&Convert, is ranked number three in the social media world and he’s consulted for 29 of the Fortune 500. Baer pointed to social media as being the single most transformative of any technological development in the business world, as it has fundamentally changed the relationship between the business and the customer. Businesses are constantly changing to adapt to social media and the power is no longer in the business itself or in its branding – it’s in its network of connections. Baer talked about social media as your early warning detection system when it comes to buzz about your company, and if you’re not paying attention to what your customers and potentials are saying about your brand, you won’t succeed as a business. Adopting the words “Thank you” and I’m sorry” will go miles when it comes to customer service in the social world, and companies looking to be more social would do well to incorporate these simple but powerful tools. Finally, Baer brought up the point that social media is becoming a skill as opposed to a job – perhaps to the chagrin of the room full of social media professionals. He said that every person in the company needs to be doing social media and interacting with his or her clients, and it is not the responsibility of just one person or one department. My favorite session was “Read Anything Good Lately? How WOM, Social Media and Recommendations Drive Media Consumption.” The panel consisted of Stacey Ballis, Carrie Goldman Segall and Nicole Knepper, three sassy, brassy women who all blog and have published books that became known largely due to social media. The panel talked a lot about how to use social media to your advantage as a new blogger or a self-published author. Takeaways from this session include being a real person and maintaining authenticity on social media. The panel agreed that social media should be “95 percent social and 5 percent media.” Communicate with your followers, comment on others’ blogs and maintain a consistent sense of self. Also, it’s important to keep things in perspective. Social media is important but it isn’t real life. Don’t become so involved with your fans online that you forget to walk the dog, and conversely, don’t ignore what’s going on in the social media world when it comes to your readers and fans – especially if you’re trying to sell something or promote your brand. And, as in life, you don’t need a million followers, you just need the right ones. Another key is to write what’s in your heart and be true to yourself. Knepper, who’s blog and Facebook page are titled Moms Who Drink and Swear and who tweets @queenofcussin, probably put it best when she said, “Don’t compare yourselves to others. You will be miserable.” This is a great lesson when it comes to blogging and other forms of social media as well as out in the real world. All three of the panelists were real, down-to-earth and hilarious. It was a fun session, and I wished it could have gone on much longer. But, all good things (including this post) must come to an end. I really enjoyed my Social Media Week experience, I learned a TON and I can’t wait for next year! They say the best way to learn about something is to immerse yourself in it, and that’s exactly what over 16,000 social media professionals did as they descended upon Chicago the week of September 24. This year’s Social Media Week consisted of about 95 sessions featuring 250 speakers at 40 different venues around the city. Personally, I represented Hinda at 12, which felt like a pretty full schedule considering the amount of information that was packed into each session, while still managing to pop into the office for a few hours in between. I won’t get into the gory details of each session here, but I do want to point out a few highlights from what was a terrifically informative, fun and free week of social media madness. One factor about social media that makes a lot of sense but that many people (including yours truly) probably don’t think about are the legal implications of hosting contests, sweepstakes or other online promotions that involve rules, regulations and privacy concerns. At “Pinning and Winning: Activating Social Contests,” we heard from Linda Goldstein, Partner and Chair of the Advertising, Marketing and Media Division of Manatt, Phelps and Phillips, who talked about the legal risks involved in hosting online contests, specifically compliance with lottery laws, disclosure of rules and privacy policies and intellectual property liability for content use. Stay tuned for Part II of our Social Media Week wrap-up this Friday! Wellness incentives and workplace health initiatives are all the rage right now, with more and more companies adopting wellness programs and offering incentives to employees who commit to embarking on a healthier lifestyle. Workforce.com writer Michelle V. Rafter covers this topic in her recent article, titled “Can Social Media Produce Wellness Results?” In the article, Rafter focuses on New Jersey’s Chilton’s Hospital, which, in March 2011, entered a countrywide fitness challenge after trying for years to get its employees to better monitor their health. According to the article, employees formed teams of six in competition with other local businesses to see who could eat the healthiest, walk the most or lose the most weight. During the 100-day challenge, participants used a private, Facebook-like social network to share results, cheer each other on and get involved socially. As an incentive to participate, Chilton Hospital offered $150 to each member of the winning team and $500 to the employee who lost the most weight. But it wasn’t necessarily the money that was driving would-be participants to sign up. “People wanted to be on the winning team,” says Julie McGovern, Chilton’s VP of Administration and HR. The argument can be made that it’s now easier and perhaps more fun to be a part of a work-related wellness challenge or health initiative that has a social networking aspect attached to it. People spend so much of their time on Facebook, Twitter and similar sites during the day anyway, why not appeal to this interest and turn their social networking time into something a bit more productive, not to mention good for helping keep employee health care costs down. While it’s certainly not necessary to incorporate social media into your wellness program, it is a good way for participants to interact, share results and track their goals. And as more employees are bringing their smartphones to work, it becomes easier for participants to stay connected to games and social media either on their own or in conjunction with their company’s wellness program. Some companies are already reaping the benefits of employing healthier workers in the form of lower healthcare costs and fewer medical claims. According to the article, Sprint Nextel Corp. estimates it saved $1.1 million through a companywide fitness challenge launched in 2011. Read the Workforce.com article here and get more ideas about how your employees can benefit from developing a wellness program. PS: June is Great Outdoors Month! Why not get outside and enjoy the weather and the free exercise opportunities while they last? Plan a hike, fly a kite with your kids or bike your local riverfront or shoreline trail! A lot of our readers and subscribers are loyal fans via our blog. However, our social media footprint expands beyond just our blog. You may have noticed the links on the right of the page...if you click through to the website. If you're a subscriber, these links may have been lost on you. Below are a few other ways to connect with Hinda online. You can find us as @hinda_incentive on this microblogging site. We are fairly active on here and actually like to engage in conversation with others. It's a great conversational tool for us and we love to chat with anyone willing. This is also a venue where we post new videos, blog posts, and even a few fun photos from inside our own office. More of a LinkedIn fan? We can relate. There's a growing audience on LinkedIn. Though there isn't much opportunity for engagement from a brand perspective, anyone can follow our activity online. Simply click here or on the LinkedIn icon on the left of the page to follow us on LinkedIn. On our page you can see our new hires, most recent tweets and blog posts, and even learn (and recommend) some of our services like Custom Packaging or the Warehouse Dash. We've not done a lot on Facebook until recently but now like to hang out here online as well. Recently, we've created a new Welcome splash page for new visitors. The Welcome page shows off how to contact us via QR code, info and links to more info about the Warehouse Dash and Custom Packaging, along with some fun photos. In addition, our Fan Page is where we show off photos from inside the walls of our company, host all of our YouTube videos, and even post content straight from this blog. We've also integrated our Fan Page with our Places page. That way, if you ever have the pleasure of checking-in at our office, you'll link right to our fan page. Using a service called JumpScan, we've made contacting us through mobile devices even easier. Using a scanner application on your smartphone, you can simply scan the 2D barcode on the right of our home page (will need to click through to see it) and pull up ways to contact us via phone, email and social stream with the simple touch of a button. Doesn't get much easier than that. Want us to connect with you? Shoot some contact information in the comments below, drop a note through the contact page or send us a message via one of the above social channels. We'd love to hear from you! Our booth in actionWhat a whirlwind of a week last week was. 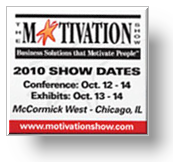 Participating yet again in the Motivation Show at McCormick Place, we brought not one but two booths to the show this year. In addition to our recognizable conference area seen at the show the last couple of years, we also brought to the table a merchandise booth, showing off some of the hottest new trends in merchandise programs this year. We also had the good fortune of being able to be positioned near Helping Hand Rewards, a socially responsible initiative founded by our current CEO Michael Arkes. Michael has done a lot of great work getting HHR off the ground the last couple of years, so it was a thrill to see him recognized by the IMA with a Circle of Excellence 'Social Responsibility' Award. Running HHR as a completely separate entity from Hinda, he's done a lot using his business know-how to help positively impact those less fortunate. Paul Hebert, managing director of I2I, even featured HHR on his monthly Influence Insiders monthly podcast. 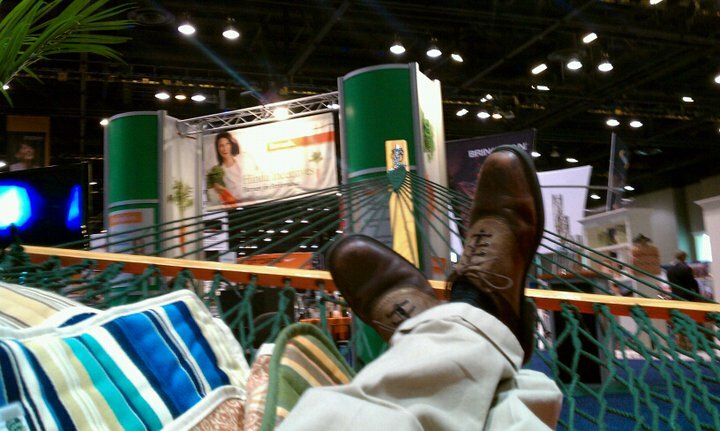 We blogged a couple of weeks ago here about seeing social media at the show. In comparison to last Giving the legs a breather year, there was definitely a great increase in participation through social channels and the Twitter hashtag #moti. Us along with Helping Hand Rewards initiated a geolocation effort, setting up Foursquare check-ins for our respective booths. Others also used Foursquare to check into the Motivation Show itself, resulting in a fierce competition for mayorship between @drewhawkins and @incentintel. This year we tried to emphasize more sharing than marketing. We shared pictures of the show on Twitter and Helping Hand Rewards even uploaded some viral video of the show through YouTube, marking each video with the #moti hashtag. Others even shared learnings from keynotes and sessions on Twitter for those of us who may not have been able to attend. Though there were probably only around 20 people actively sharing, it showed a giant leap in our industry's adaptation of social media. All in all we had a great time at the show this year. Of those of you that attended, what did you think of the show?